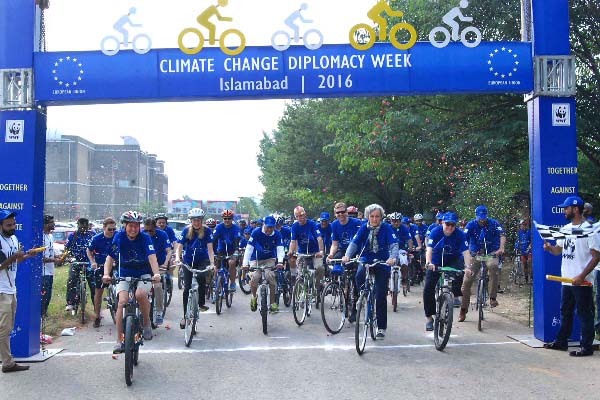 ISLAMABAD, Sep 25 (APP): The European Union delegation to Pakistan and WWF-Pakistan joined hands to create awareness about climate change-related issues by celebrating Climate Change Diplomacy Week here on Sunday. The event started with the participants pedalling their bicycles from the Pakistan National Council of the Arts (PNCA) on a designated route as a symbolic gesture to raise awareness to curtail the growth of greenhouse emissions by promoting eco-friendly modes of transportation. The cycle ride was followed by the screening of a thematic documentary, “The Karakorum Anomaly” about the effects of climate change and its influence on the mountain regions of the country. The Ambassador also explained the rationale behind today’s initiative.” He said Pakistan was ranked as one of the most vulnerable countries as regard to consequences of Climate Change, adding this event would contribute to raise awareness in Pakistan on the importance of tackling this issue. He said it was also an opportunity to create synergy between different actors, government representative, diplomats, civil society and media in an enjoyable and meaningful environment Speaking on the occasion, Hammad Naqi Khan Director General WWF-Pakistan, stressed the importance of promoting a common worldwide understanding of the need for action to mitigate climate change. Hammad Naqi Khan showed optimism while referring to the momentous achievement of the world community in shaping a global agreement in Paris last year at the 21st Conference of the Parties held under the United Nations Framework Convention on Climate Change (COP21) and called for a global alliance against the growth of greenhouse gases. Martine Dorance, Ambassador of France and the Charg’ d’Affaires of Morocco, Dr Mohamed Kalakhi, were invited to recall last year’s COP 21 milestone that represents the Paris Agreement in the fight against climate change and how Morocco is preparing to host the COP 22 conference, which will be held in November in Marrakesh. Each year, in September, European embassies around the world celebrate the Climate Diplomacy Week. Although Pakistan’s global carbon emissions are very low compared to large emitters like India and the USA globally but it is placed in the top ten countries that are highly vulnerable to climate change.